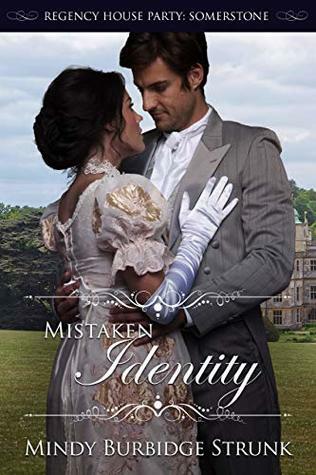 Jessica Standish has been drawn to Lord Ian Pinkerton since she saw him, hoping that he would notice her. But with little to recommend her since her father's untimely death, her hope is unlikely to be fulfilled. But as Aunt Lydia repeatedly reminds her Lord Ian "is a complete rake and would destroy" her "tenuous status within the ton." When Jes and her mother Lady Rachel Standish are invited to a house party, Lady Rachel sees this as a chance to secure a suitable match for Jes before the true state of their dire financial situation is known. At the Somerstone Estate of the Countess Du'Brevan Jes is surprised to see that Lord Ian is in attendance. And upon closer acquaintance, he seems quite different from his reputation. But Lord Ian is not whom he appears, rather he is Conrad Pinkerton, the Marquess of Kendal, Ian's older twin brother. Hoping to aid his brother Conrad pretends to be Ian, though other than appearance the two couldn't be more dissimilar. One to normally avoid social events, Conrad is pleasantly surprised when he makes the acquaintance of Miss Jessica Standish. But as he finds himself drawn to this most unique young lady he finds himself in a quandary - Jes thinks she is heading towards a possible understanding with Ian! With a case of Mistaken Identity, someone is about to get hurt if, or rather, when the truth comes out. The only question is how many hearts will leave Somerstone forever broken? 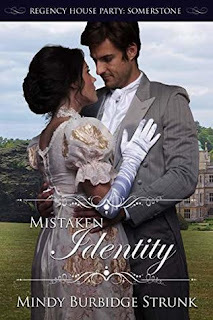 Mistaken Identity is a most enjoyable addition to this series. It is interesting to see how Ian's "friends" interact with him at this house party. The interactions between Jes and Conrad are fun especially Conrad's stories about Somerstone. And then when one gets glimpses of Ian himself, ughhh what a total jerk. This is the third book in this series all of which can be read in any order or as a standalone book. The series is written by different authors who focus on a different pair of main characters which adds a unique voice to each story. I enjoyed this book and read it in one evening which when one has an early morning workday isn't always a good thing but it was well worth the late night and lack of sleep. I was provided a complimentary copy of this book through SLB Book Tours with no expectations but that I offer my honest opinion ~ all thoughts expressed are my own. 1) Who is your favorite comfort read author? I have several. Rachael Anderson, Rebecca Connoly are at the top of my list. But when I am reading for comfort, it is usually specific books that I read rather than a specific author. At Christmas, I always read Santa Maybe by Aubrey Mace. Halloween is always Unlikely Match by Sarah Eden. At other times of the year, I will often read Seeking Persephone, Kiss of a Stranger, or Friends a Foes by Sarah Eden. Edenbrooke by Julianne Donaldson, Royal Target by Traci Hunter Abramson, or the Haggarty Series by Betsy Brannon Green. 2) What do you most like about the Regency era? I love the properness of it all. I love that a simple brush of hands or a look can stir so man emotions and physical responses. I watch TV and see how fast romance moves. There is just something comforting about knowing the kiss will not happen until the end. 3) What one author past or present would you like to mentor you? Obviously, Jane Austen would be the top of the list. But I would also love Georgette Heyer. For the present day, I would love to be mentored by either Rachael Anderson or Sarah Eden. 4) How do develop your setting (a photo, a trip, a random comment)? When I first get an idea, I usually go through and create a Pinterest board. I find characters that fit the pictures of my characters that I have in my head. Once I decided general area, I begin to look at places in that area and pin pictures of them. For example, I am working on a story in Scotland right now. At first, I was only thinking about it being in the highlands, but after looking on Pinterest at pictures of the Scottish highlands I came upon a picture of the Isle of Mull. I have fallen in love with this little island. My now fictional estate will be Dunbarton Castle on the Isle of Mull. I think it is easier to describe (sometimes to a fault) and immerse myself in the area if I have as many pictures as possible in my head to help me feel like I am there. 5) If you could share a cup of tea (or coffee) with anyone who would it be? I would actually choose orange wassel, but that really isn’t the question. This is really hard to narrow down to one person. There are a lot of people I would love to do this with, but all for different reasons. I would love to chat with Jane Austen and ask her what it was like to be a woman in the 1800’s, from her perspective, not from a 21st-century mindset. How did they handle common everyday things that we take for granted? I would also love to speak with Winston Churchill. He had such a unique situation to be a commoner (kinda) but still have close links to nobility. And the man was brilliant. I would also have to add George Washington to that party. I cannot imagine the insecurities and fear that he must have faced daily with first leaving the protection and fighting against the country he had always thought of as a motherland and then guiding a new country through uncharted waters. It amazes me that America survived when everything was working against them to fail. I am sure he would have some fabulous stories to tell. 6) Do you have a favorite Regency period author that you would recommend? We are very fortunate to have some great Regency era authors. I do not think you can really write Regency without first reading Jane Austen. And I would also include the Bronte’s to that list even though they were technically more in the Victorian era. It is reading the period from people who lived in that period. There is no better source. Georgette Heyer is also a great Regency author. As for current? I have mentioned several already, although I am sure there are others I have forgotten. 7) Who is your favorite character in your book? Conrad. I love Conrad! He and Jes are a combination of my actual personality. Although, Conrad seems to have more of a filter than I do. It probably comes from being raised as a marquess. I love that he looks out for his peeps. Even Ian, who looks out for no one but Ian. I also love that Conrad can be insecure and uncertain. I know nobility is not supposed to show “weakness” but I like that Conrad shows he is still a just a man and worries about things like if a girl likes him or his brother. 8) What one question do you wish you would be asked and how would you answer it? I don’t know. For the most part, I’m scared people will ask me a question that I don’t have an answer for. Kinda like this question. Sorry about that but good answer nonetheless.